Several weeks ago, I set out to get in touch with as many successful small business owners as possible and harvest from them as many insights as possible for how our readers could make sure their businesses lived past their formative years. I was floored with the amount and the range of advice pouring in – namely from HARO, Reddit, & personal emails – and this guide represents the curation of that advice. Over 50 hand-picked tips, practical advice, and laid out strategies coming from business that stayed small, business that grew huge, businesses founded by Superbowl-winning athletes, and more. In short, there’s something here for everyone. If you like this / find it helpful, please do share it and spread the word – or at least drop us a comment! 1 – You’re going to work long days and through difficult times, so you’d better have a passion for what you’re doing. “I believe, the single most important factor in running a small business is passion. You HAVE to be passionate about what you’re doing, not only to make it through the first year, but through every day. As you will know, being an entrepreneur isn’t easy. While there are highs, the lows have the potential of killing that passion, and therefore the belief that you can succeed. As many small businesses can’t afford a large team to keep you going, you need to wake up every morning (sometimes dragging yourself out of bed to face another day of challenges! ), with the same passion and energy you had when you first thought of your small business idea. If you’re not able to do this, you’re not going to make it. Entrepreneurship is an emotional rollercoaster! 2 – Don’t be afraid to ask for help and work with a mentor to help accelerate your path to profitability. 3 – Make your company a person, give them an identity and core values. 4 – Help entrench goals in your subconscious by writing them down and reviewing them each day. “I recommend that entrepreneurs go to a quite place out in nature and write down their goals. It is so important to read your affirmations and goals daily, as I learned that if you read something over and over again, your subconscious mind will believe in it and bring it to life.” – Gwen Keefe, founder of children’s cup company Poli Sippy Cup. 5 – Be proactive about getting your mind in the right place to succeed. 6 – Set your sights high, then get obsessed. “ My latest business, an insurance brokerage grew 127% in the first year. The approach that ensured the growth of the business is obsession with getting the business off the ground and successful. Most people who start a business want to survive the first year, well I wanted to thrive, so I invested all of my resources for 365 days, non-stop. No vacations, very little days off, and the perpetual grind. I was called crazy, irrational, and yes, obsessed, but I wouldn’t do it any other way.” – Michael Senderovich, President of Zeyger Insurance. 7 – A handful of lessons from business veteran Ben Brooks. Getting organized: I’ve always considered myself a fairly organized person but the systems I used to stay that way quickly collapsed as I took on the complexity of an entire business. I ended up hiring a Certified Professional Organizer (CPO) to work with me on getting hyper-organtized, both in the physical and digital sense. I’ve found that staying organized is mission critical to managing down my anxiety and feeling powerful. Focus on earning money, not spending it: When people first get started with a business it seems all of the focus is on spending money, not earning it. I got great advice that instead of worrying about everything I’d eventually need to buy or build, I sound instead put my focus on how to earn money now. In reality what you invest in early on is often wrong because you learn a lot along the way. So resist the temptation to make big investments until you get out in the market, deliver product/services, get feedback, and learn. Sadness: There’s a lot of talk about Fear of Missing Out (FOMO) that social media arrouses in us. When you start a business you simply have MO, as you know you’re missing out on other things so you can focus and put the effort into your new venture. This brought me a significant amount of sadness even though I knew I was chasing my dreams. Conviction in myself: A surprising upside benefit of starting a business was greater self confidence. By investing my own money, time, social capital and reputation into my ideas I developed greater conviction in my own capabilities. How I hold myself in groups, what behavior I put up with, and how I chose to spend my time have all evolved. Shedding perfectionist impulses: Since I’m the owner of my business with my proverbial “name on the door” I had impulses to try and make everything perfect. After all, it was a reflection of me, right? I’ve learned that I waste a lot of time and resources on too many rounds of revisions without getting useful feedback, and in the end produce too little as the process is so inefficient. Getting more comfortable with things being imperfect, incomplete, and in process has allowed me to get things to market faster, learn more, and be innovative. Managing myself: While it sounds great to “be your own boss” who cracks the whip, gives you feedback, provides encouragement, and recognizes your achievements? Oh yeah, maybe having a boss isn’t so bad after all. In addition to everything else that business owners have to learn and do, being their own manager is a rough adjustment. Website later: EVERYONE is obsessed with the idea that they need to build a website (and design a visual identity) before they are in businses. But ask yourself, why? What role does your website have in your business? Unless you are in ecommerce it is often just a calling card or fancy brochure. I developed a 6-figure business with only an $88 investment in busienss cards before I ever created a website. 8 – Grab a mentor; even if no one’s done exactly what you are, there are others out there with invaluable experience and direction. 9 – Don’t just “wing it” when it comes to scheduling, write out time windows for each task for the day and stick to them. 10 – As a business, act – right now – how you want to act when you grow up. “In the quest for short-term survival, small companies commonly act very inefficiently, with multiple members of the team helping out with all aspects of the operations, marketing, sales, et cetera. Unfortunately, this also means that no one team member is truly accountable for any one aspect of the business. If something goes wrong somewhere along the way, who takes responsibility for that? Clearly define your roles, clearly define your processes, and clearly define exactly how you want your business to work from the very get-go. By doing so, you can scale much more easily and have a company organizational structure that others can buy into. 11 – Ask your customers to help dictate product direction first. “My piece of advice is to leverage your prospects/customers to make business decisions. Before even building a product, get in touch with prospects and have add many conversations as possible. Let them make decisions for you instead of guessing or doing “what makes sense” to you. 12 – Audit how you spend your time each day. As Tea Drops has scaled, I have learned that focus is paramount. I listened to a podcast earlier this year that really revealed the lack of focus often prevalent in the workplace. It stated that on a good day, business owners spend roughly 23 minutes of their day on work that is actually important. The rest of our day is often spent tackling urgent, but non-important work — or worse, unimportant tasks. It is key to think about how we spend our time each day. Time is one of the few commodities that cannot be replenished. One critical exercise I’ve found helpful is to outline my top three priorities as soon as I awake. Then there is no question as to what I need to work on during the day and limits the opportunity for distractions to creep in. Another helpful exercise is to make every effort to not check email until after my first priority of the day is complete. Email should be a helpful instrument to accomplish your daily tasks, but the inbox should never be allowed to run your day. I’ve found it helpful to turn email notifications off my phone and computer, and to set aside certain times of the day to check email (5-10 mins max) with the purpose of efficiently responding — that means not letting emails that could be responded to in a minute or less sit there and take up inbox space. Emails that require a longer response can be addressed at the end of the day. 13 – Don’t be afraid to pivot and change direction as you find your place. 14 – Plan for the best, prepare for the worst, AKA have a buffer. “Everything you’re planning on could go wrong. Most critical is that things will take longer and will cost more than you expect. You survive by working in a buffer into your planning. Hope for the best, assume the worst. We thought what we were doing – texting between businesses and customers – would catch on within 12-24 months. It has taken four years longer. We are now 10,500 businesses strong. At the end of year 1, we had less than 1,000 and struggled to grow. If not for being very scrappy and frugal about our finances initially we never would’ve survived to see the market come into it’s own. We know this for a fact because many of our competitors who started around the same time (and even raised more money than us), didn’t live to see the day. 15 – Pay painfully close attention to your first 100 customers. 16 – Establish your longterm goals from the beginning, then plan out the sacrifices you’ll need to get there. 17 – Don’t be afraid to seek financial support, but also have a clear gameplan to present. Seek support… For any small business owner (athletes included), there comes a point when you can’t (and shouldn’t) dive into your own pockets anymore. And for some, that point might come during the first year in business. The more you speak with people who are successful in business, the more you realize no one uses their own funds and resources exclusively. It may be difficult at times—I had to really fight with myself because I hate asking for things—but seeking financing to expand your business is a savvy and smart decision. Whether you have to or not… learn to bootstrap. There’s an insane amount of funding being passed out in the start-up space this generation. Seems like almost any millennial with an idea feels entitled to ‘freebies’ and far too often we as a generation are set up to be ‘soft.’ There is tremendous value in the ‘grind’ of only having two pennies to rub together. It is the absolute birth place of creativity and determination to do things you wouldn’t consider yourself capable of. Big things happen when people are stretched far enough to grow. You’re more inclined to see opportunities you otherwise wouldn’t when you have to proverbially squeeze water out of a rock. You value clients who are the feedback of your market space because they are your oxygen. Too much funding can be a slippery slope in early stages of a company when the safety net is always in our peripheral. Not to mention the personal development that comes from an entrepreneur when she or he has to make sacrifices to create what they are passionate about and push through the resistance life throws our way. Lessons learned in the bootstrap phase creates a grounded and inspiring leader as a foundation for a company. 19 – Learn to manage your money and exercise self-control. The best thing you can do to make your business last past your first year is manage your money like crazy. If you are lucky, you are working off savings or have an investor. If you also have to hold down on a job, things are going to be tough! The number one reason that businesses fail is that they run out of money. So, make a financial plan that makes sense, and stick to it. My first year in business I made about $5,000 — and I live in San Francisco! I bootstrapped everything (luckily, digital marketing doesn’t have much overhead) and started building my brand. This is extra advice, but you have to keep your attitude up the whole time. It helps to understand that, unless you are an exception, business will be slow at first. Take time that year to build your brand, get ultra organized, and practice self-care so fear doesn’t start controlling you. And watch yo’ money, honey! The best piece of advice I can offer is this: Look for where the intent to buy already is. If you want to start a food truck, the absolute best place to go is where the hungry people are. For us, when starting LawnStarter Lawn Care Service, we started with direct mail. It worked — and still works — but only during certain times of year. Plus, it was expensive. Then we tried daily deals, and that worked but attracted people who just wanted a deal — not people who would be long-term customers. So we started asking people where they learned about their lawn care provider. The two top responses were searching Google for lawn care near them and looking in the phone book. So, we started investing in those channels, and that’s what brought us from dozens to thousands of recurring customers. 21 – Your passion is important, but not as important as making sure it addresses customer pain points. 22 – Get personal with your customers, remember you’re building relationships in addition to just closing sales. 23 – Nail your value proposition before starting your marketing. “The main mistake I made when I first started my business was failing to nail my value proposition or what is it about our product and offer that compels people to say yes? Until I knew this, any marketing efforts or spend in any channels was like like pouring gasoline on wet leaves. For instance, when we first launched, we thought people would like our service because it’s a cheaper way to get their grass cut. What we found through copy testing in different channels such as ad-words and FB is that the customers ability to get same day service is a much more effective and compelling subset of our value prop that drives more visitors and more conversions on our landing pages. 24 – Always have a guarantee for your customers that addresses their most likely concern(s) with your product. “Always have a guarantee. If you know what concerns your customers – whether it is fit/ size (clothing), timelines (delivery by a certain date), or taste (food! ), have a guarantee that directly addresses their concern. For our customers – mostly men buying gifts for women – their #1 concern is, will the lingerie fit? Our company has a 100% fit guarantee. The guarantee “seal” is on every page of our website… We believe that this guarantee has helped [Enclosed] tremendously with securing customer purchases. Although we can not show an uptick in sales because we’ve had this policy since our launch, we’ve received numerous reviews that have shown the effectiveness of this guarantee. 25 – Get creative with your market research. 26 – Marketing doesn’t have to come with a hefty price tag. In fact, it probably shouldn’t until you’re making sales. “My advice would be to keep overhead and startup costs as low as possible. We’ve kept marketing costs to almost nil by writing and pitching human-interest stories about how our invention and business came about. 27 – Start telling your story to anyone who will listen, and then some. 28 – Free doesn’t always mean you’ll make less money. 29 – Don’t be afraid to make a splash and stand out from what’s “expected” in your industry. 30 – Researching your customers should be priority #1. Do your research and get educated—Many new business owners focus their attention on their skills and industry knowledge. Many don’t take the time to do additional research on their ideal customers. Also, to find new business ideas, often the best sources are from other industries and markets. When seeking new answers, all business owners are your peers. Zondra Wilson, owner and founder of Blu Skin Care, LLC. 31 – Facebook advertising with a laser focus and attentive split-testing. 32 – Get a toll-free number to help instill trust for larger purchases. “If you sell online, get a toll-free phone number, put it front and center on your website and make sure to answer it when someone calls. Before we got ours, we were selling a lot of our lower-priced items, but almost none of the higher-priced ones ($1000+). Once we put the 800 number on our website, we started getting a few calls per week from customers who ended up buying higher-priced items. 33 – Constantly and consistently put your brand out there to help cultivate mindshare. 34 – Think outside the box when it comes to social networks & communities. 35 – When you land press coverage, take full advantage and use it as more than a passing mention. 36 – Think about goals other than direct profit that might add to your appeal. 37 – Listen to what people want, even if it’s not what you thought they wanted. “[You should] listen to what people want not what you want: What I wish someone had told me early was don’t try to be all things to all people. We have had the most devoted 18 month – 5 year old crowd you could ever want. But when our kids grew up, we wanted to add more and more for older kids. The problem with that is the kids naturally moved on to other things, mostly sports related that we just didn’t have the space to compete against. By focusing so much time and equipment towards that older group, we spent less money on advertising and equipment for the customers that really wanted to come to us. “…Be straightforward with your customer, I want you to pay me to join this class or camp. We gave away a lot of free community events, and did a lot of fund raisers for schools and charities around us, but we never made them an offer afterward. i.e. your people that just had a great time at our gym, and really appreciate that we helped you out, can now get 15% off of _______! 38 – Track your marketing campaigns, relentlessly, so that you won’t waste money on low-ROI activities. 39 – If you have a unique product but no established brand, don’t think this means you need to be a wholesaler – start making sales on your own site and Amazon from day one. “If you have a unique product, start selling online via your own online shop and on other popular platforms such as Amazon. We were partnering with other online retailers and focused on wholesale for the first 5-6 years. Should have started our own online shop and selling on Amazon right from the start. Our online sales are up 40% from last year, partly due to selling our products on amazon.com and amazon.ca, and sell to some key online retailers which move significant volume. 40 – Outsource early so you can focus on your strengths and the most critical areas of developing your business. 41 – Make sure your initial team can make up for any skillsets you lack. 42 – When choosing who to surround yourself with, remember that you hold the keys. “Don’t listen to all of the naysayers. As soon as you decide to start a business, you will find a line forming of people (supposed experts) telling you “it won’t work”. If these people really knew so much, they would be successful entrepreneurs themselves. Don’t take advice from someone unless they meet two criteria, one – they have started a successful business themselves and two, they are a hundred percent committed to helping you make your business successful. 44 – Establish brand, voice, and culture early on. While your product may change (or might be perfect from the beginning! ), you should focus on building a consistent brand and voice that won’t fall apart just because a certain product line does. “We’re now going on four years old and I think the most important thing I would tell a new small business owner is to remember to establish a brand and culture that is coherent, communicated well, and worth fighting for from the beginning. Your products can be the best thing in the world and sell great, but your brand is your legacy. If you establish that clearly and firmly from the start you’ll be a lot better suited to make a lasting impact that you and everyone else will want to be a part of from the start.” – AJ Fountain, president of Dr. Squatch Soap Co.
45 – Encourage leadership to blossom. 46 – Be a great leader not through having every answer, but through approachability and humility. “Fantastic leaders earn respect by being humble. They leave the ‘my way or the highway’ mentality at the door. They also roll up their sleeves and work with the team by brainstorming and sharing ideas to work through complex issues. They foster an atmosphere where it’s not only acceptable, but desirable, for the team to ask a lot of questions. Great leaders are also honest about the fact that they don’t know every answer, and that they’ll know a lot more two years from now than they do today.” – Ross Cohen, co-founder of online background check platform BeenVerified. 47 – You’re no longer a regular employee, so come to terms with being a fully-responsible business owner. 48 – Before hiring for a role, test it yourself to make sure your business can get direct value from it. 49 – Practice consistency, don’t take a day off. 50 – Look for the quickest path to your task goals. 51 – Be ready to pivot (and appreciate your ability to do so as a new/small business). 52 – Dig down and find your business model before scaling. 53 – Find creative ways to source your talent. “I was spending a lot of money on getting products shots for my brand. Products shots required a studio rental, hiring a photographer, models, stylists, makeup artists and not to mention my time on site the day of the shoot. I had the idea one day that cell phone cameras have come a long way and many of them now take excellent photos. I thought, why hire a photographer, stylist, makeup artist, etc when I can find aspiring models with a good sense of style and makeup skills! With the internet and social media there is no limit to connecting with people around the world. Antoinette Rodney-Celestine, Founder of oneWORD, a clothing company with a mission. 54 – Don’t be afraid to get your hands dirty. 55 – Just because you’re a founder, don’t be a jack of all trades and master of none. 56 – Personalize what you can, automate the rest. 57 – Map actions closely to ROI; skip the nice-to-have in favor of the practical. The best advice I can give new small business owners is to focus on marketing, and more importantly, a return on investment. In the first year it is easy to get caught up in actions that won’t actually generate any cash flow. A lot of new business owners are in a hurry to buy new chairs, desks, expensive equipment, business cards, letter heads and many more things that, in retrospect, will mean nothing for your growth. This is a dangerous allocation of money and time because it can be the reason you don’t make it out of your first year. Instead focus on determining how you are going to consistently acquire new customers through different marketing strategies. This goes for both internet and brick and mortar businesses. In our first year we were so busy trying to perfect the website that we didn’t realize this whole time we didn’t create a way to generate leads and the cash was running low. We lost our office and all the fancy tech we bought in the process. We survived by selling everything and using the cash to attack our content marketing and SEO strategy. This allowed us to start closing sales from our own leads within a couple months and brought us to positive cash flow. We then continued to focus our efforts on that strategy and doubled our revenue every quarter since. So my advice is to build your marketing, then your sales, and your business will have no choice but to grow from there. Constantly focus on the concept of opportunity cost and always choose to allocate all your resources on the activity that will have a direct impact on your revenue. Most new businesses don’t do this, and end up in the graveyard as a statistic. You can focus on being perfect and making a difference once you are making revenue, you have to make money before you can make change. – Sean Dudayev Co-Founder/CMO at InsureChance Inc. 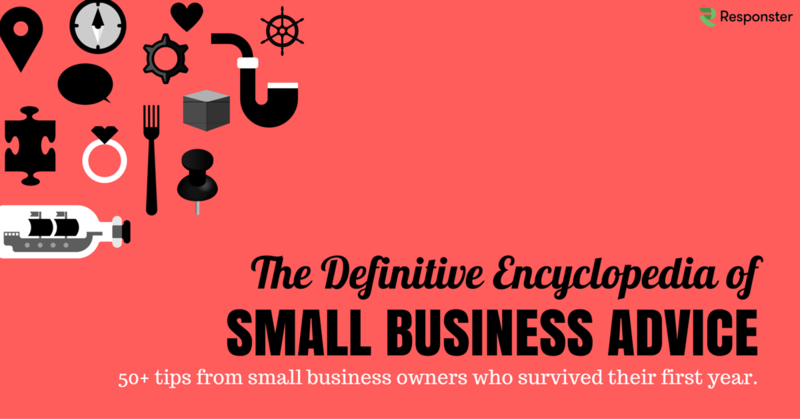 Which small business tips were your favorite? Which will you put into action *right now? * Let us know!